Today’s Ten On Tuesday topic was suggested by Dale. He was looking around our house and loving all of the things we have that are made from wood and he came up with this: 10 Favorite Things I Own That Are Made of Wood. Let’s go! Our kitchen table. It belonged to Dale’s grandparents and it brings me so much joy to use it every day. My Reeves spinning wheel. Solid oak and my favorite wheel of all the ones I’ve owned although I use the Sidekick much more frequently. Our tv console. We bought it a few years back and I love the style and the darker wood. The liquor cabinet that Dale made ages ago. It used to hold towels but really – priorities. My bird’s eye maple kaleidoscope. We bought this a few years ago on vacation on Cape Cod and I love it because the wood is beautiful. The couple of cranberry crates that we have. They are great for displays and an excellent reminder of our local agriculture, too. My Wheaton College rocking chair. My parents bought this for me as a graduation present and I have made a place for it in my house ever since. The Swedish dala horses. Some I’ve had since I was a little girl and the biggest one was a gift from Dale just a few years ago. They are bright and colorful and remind me of my heritage. A multi-wood cutting board. I bought it at a craft fair and it’s more decorative than anything but I do love all of the different woods. Our duck decoys. We have several antique decoys and I love them for the folk art feel they give to our living room. I almost listed my house because that’s made of wood and it holds all the things I love most in the world! How about you? Do you have things made of wood that you love? If you’d like to subscribe to the weekly Ten On Tuesday email list please click here. I wondered where this idea came from … thanks, Dale! My kitchen table is first on my list also, and your bird’s eye maple kaleidoscope is really beautiful. Liquor is far more important than towels! I agree, thanks Dale! My dining room table is first on my list too. I also love your decoy – wow, that is so beautiful. 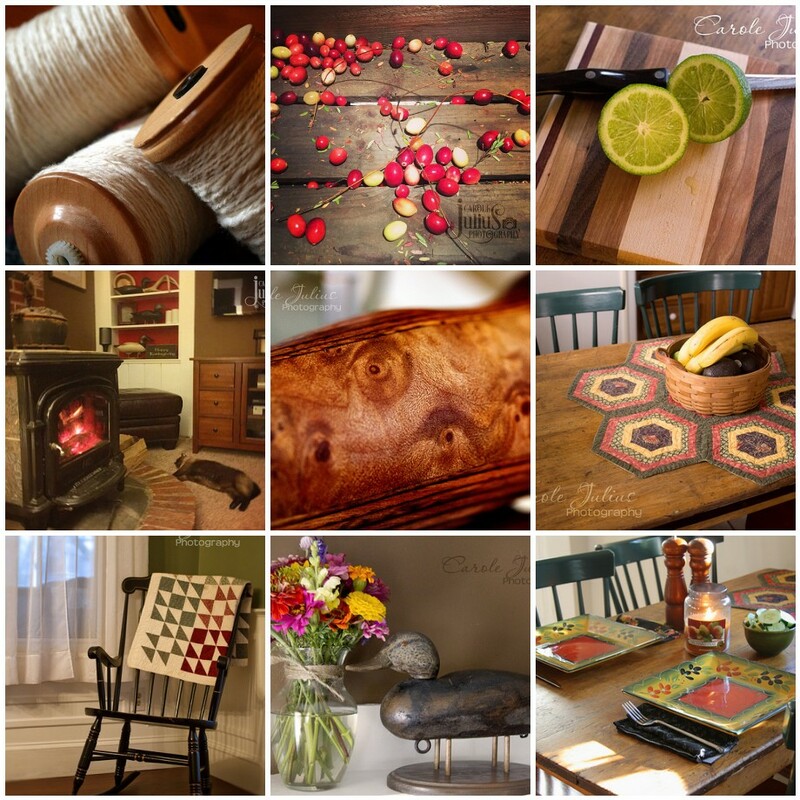 Cherished items are often made of warm materials, and wood is one of the finest. Thank you for a great topic and for sharing your many lovely wooden keepsakes. My favorite subject!! I love that kaleidoscope! I love that your kitchen table holds so many memories! What a pretty cutting board. Our dream is to own a birds eye maple table one day. The kaleidoscope is lovely, the topic is great. Thanks Dale! My favorite wood thing in my house are the Amish cabinets we splurged on for our kitchen redo. I occasionally watch HGTV and have nightmares of some entitled millennial looking to buy our home and planning to remove these gorgeous wood ones! 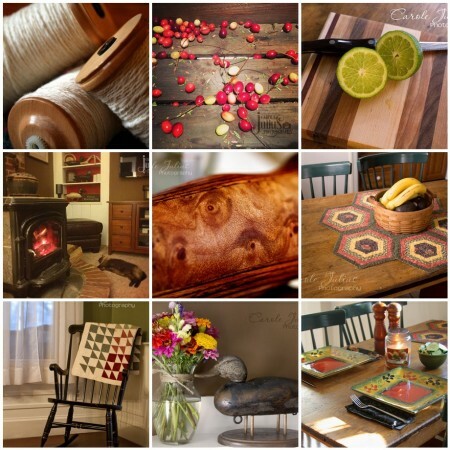 A spinning wheel and lovely repurposed pieces – that’s what I think about when I think about things I love made out of wood. Thank for you another great week!